World Liquefied Natural Gas Database is your portal to detailed information on global LNG trade. The LNG database gives detailed and up-to-date analysis of LNG infrastructures, contracts, flows and prices. It identifies key gas companies through their shareholdings in LNG plants, highlights major projects in new gas producing and importing countries and allows to plan future LNG market developments. What are the most active investors by country? Which countries are developing their liquefaction/regasification capacities? What are the major business deals between companies? Who are the main suppliers/clients of a given company? What are the importing/exporting prices by country? Status: planned, approved, under construction, operational, closed, cancelled, etc. Terminal status: planned, approved, under construction, operational, closed, cancelled, etc. Interested in LNG database without annual subscription? 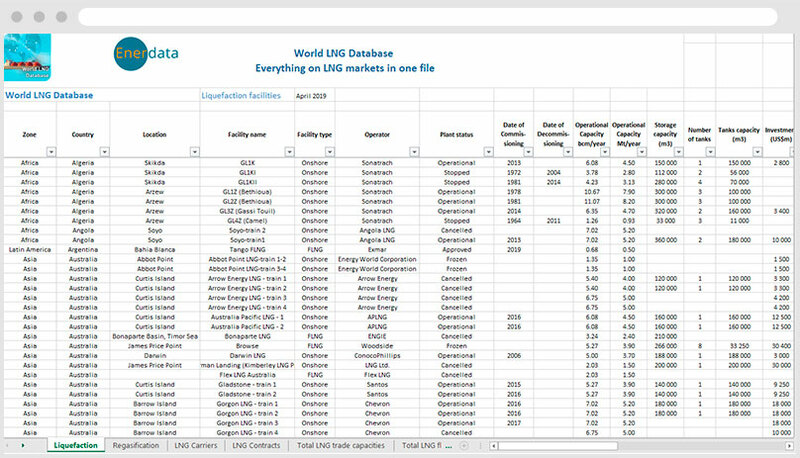 Curious to know about LNG data in a specific region? Access Enerdata’s Region Database online, the one-time data export service to acquire the latest database of a specified LNG region directly in Excel format.